Feel light, fast and connected to the road in the adidas Adizero Boston Boost 7. The design is iconic- a classic looking shoe which includes modern features to deliver the perfect shoe for top racing performance. Made of highly breathable air mesh, the material allows air to circulate freely to the foot, increasing the ventilation and keeping your feet cool during races. The shoes also feature a Microfit system that locks down the heel and midfoot for a secure fit. 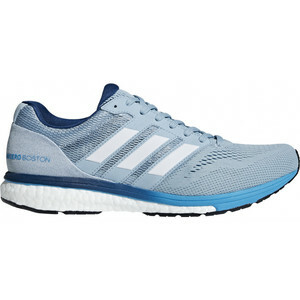 The Mens Boston Boost 7’s in Blue include the highly popular BOOST midsole, creating endless energy on your run. Containing Polyurethane Beads, or “energy capsules”, it delivers an unprecedented level of energy return with every foot strike. Designed to respond to the runner- the more you give, the more you get. The Stretchweb technology has been intentionally placed on the forefoot and rearfoot of the outsole to give a flexible, natural energised ride. This also lowers the amount of pressure that is used during the foot strike and therefore minimises injury. Combined with Continental™ Rubber that gives you superior traction in all weather conditions, these shoes are perfect for racing in!